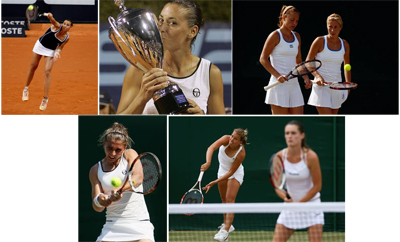 Flavia Pennetta used her [K]Blade 98 to defeat fellow Wilson player Sara Errani to take the Palermo Singles title and the Bondarenko sisters defeated Wilson duo Iveta Benesova and Barbora Zahlavova Strycova to win the Prague Doubles title. Top-seeded Flavia Pennetta did not drop a set all week on the red clay of Palermo to earn her seventh career WTA Tour Singles title. Flavia defeated good friend Sara Errani 6-1 6-2 in the final to take her 1st Internazionali Femminili di Palermo crown. In Prague, it was the Bondarenko sisters, Alona using her [K]Tour and Kateryna using her [K]Blade 98, that prevailed over first seeded Iveta Benesova and Barbora Zahlavova Strycova 6-1 6-2 for the Doubles title. The ECM Prague Open title gives the Bondarenko sisters their third WTA Tour Doubles title as a team.